United Airlines is introducing a new item into its complimentary snack rotation on domestic flights departing before 9:45 a.m. 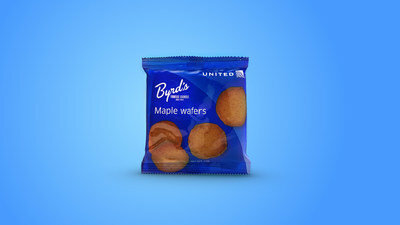 This new snack, created especially for the airline by the Byrd Cookie Company, is a maple wafer cookie that combines a crunchy texture with a sweet maple flavour. The new snack will begin to roll out on flights as early as this weekend. "We know that maple is an increasingly appealing flavour, and we are always looking for ways to capitalize on trends in taste buds," Vice President of Catering Operations Charlean Gmunder said. "We are excited to offer our customers a light, crisp snack that is created by a woman-owned bakery."